This post is part of a series celebrating the 65th anniversary of the American National Election Studies (ANES). The posts will seek to highlight some of the many ways in which the ANES has benefited scholarship, the public, and the advancement of science. 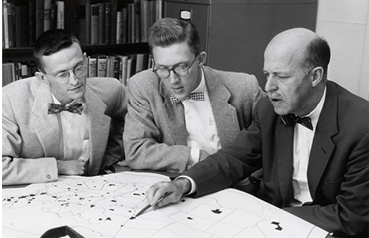 University of Michigan political scientists Angus Campbell, Philip E. Converse, Warren E. Miller, and Donald E. Stokes published The American Voter in 1960. The American Voter takes root in a time of changing notions about individuals and decision-making. In the 1940s, Paul Lazarsfeld and the Columbia school placed a new emphasis on demographic factors in responses to media and support for President Franklin D. Roosevelt. In time, the Michigan Model was revised. The original Michigan Model held party identification as king. This thesis maps onto the strong post-World War II Democratic party, strengthened by Roosevelt. In the next few decades, party identification weakened. More recently, party identification reemerged stronger than ever due to a variety of factors, including changing campaign strategy and polarization. So while these new generations of scholars find different balances between party identification and other factors influencing vote choice, The American Voter provided a bar against which this change could be measured. The American Voter also enabled the tools of measurement with ANES. The American Voter utilized early waves of what would become the American National Election Studies (ANES), which Miller himself facilitated. The ANES developed into a multi-wave, decade-spanning project offering continuous data on the American electorate since 1948. Cited over 6,500 times to date, the book remains a seminal text in political science. This entry was posted in ANES, ANES 65th Anniversary, National on December 11, 2014 by David Howell. Post developed by John H. Aldrich (Duke University). This post is part of a series celebr ating the 65th anniversary of the American National Election Studies (ANES). The posts will seek to highlight some of the many ways in which the ANES has benefited scholarship, the public, and the advancement of science. My contact with the ANES began in 1966, or maybe it was in 1967, in John Kessel’s class at Allegheny College, when we read that relatively new book, The American Voter. It was presented to us then as revolutionary and that assessment stands today. Since then, it has become my good fortune to be able to be involved in the ANES, on which that book was based, in a wide variety of ways. Let me mention two dimensions of the ANES, the CSES and the future. The Comparative Studies of Electoral Systems (CSES), led into being by Steve Rosenstone from the ANES among others, is the extension of the aspirations of the ANES into a truly comparative context. That set of aspirations was to demand the highest quality research design and data collection to enable the strongest inferences possible about how elections work. CSES is primarily the comparative study of differing democratic institutions and cultures, and the idea is to have as close to “gold standard” data collected on exactly the same topics in as many electoral democracies as possible, so we can learn just what is special to particular nations or electoral systems and what is general. The notion, that is, is to make possible the strongest science of democracy we can. We are now entering the fifth round of such studies, and the advances are becoming quite remarkable (see www.cses.org for what is nearly 20 years of research). The point is that not only was the ANES the original model, an important source of leadership, and indeed, was the justification for NSF support for the project, but all that continues to this day. The ANES (and indeed the CSES) is entering a critical period. There are two kinds of threats, and hence two kinds of opportunities. One threat is external. The cost of the maintaining the gold standard is very high, possibly unsustainably so, and funding in the U.S., as in many nations, is under threat. In the U.S., it is under political threat, as Congress seriously considers limiting the scope of the science it will support through the NSF. The internal threat is, of course, related to cost, but it is also that maintaining the gold standard of excellence in design faces new and ever stronger challenges. While the ANES has over time maintained a position at the head of the class in terms of response rates, its current response rates, like everyone else’s, are much lower than desired and also lower than they were not so long ago. And new technologies present new challenges as to how best to meet standards of excellence in research design and survey implementation. The need for both new science and its engineering counterparts in the face of declining interest in participating in surveys and other challenges is acute – but it is also something that the scientific community surrounding and supporting the ANES ought to be especially attuned to and especially good at creating. So, this is a challenge to the community to step up, as Campbell, Converse, Miller and Stokes and as Kish did 65 years ago. This entry was posted in ANES, ANES 65th Anniversary on November 25, 2014 by David Howell. Post developed by Paul R. Abramson (Michigan State University), John H. Aldrich (Duke University), Brad T. Gomez (Florida State University), and David W. Rohde (Duke University). Change and Continuity is a soon-to-be 18 book series that Abramson, Aldrich, and Rohde began in the 1980 election. Gomez joined the team for the 2012 edition; all 18 will have been published by CQ Press. Our plan was to get the best possible empirical analysis of the 1980 elections to students so that they could get a rich view of elections, indeed of the best possible science about public opinion and voting behavior, on their desks as quickly as possible. We drew from a number of sources, but there was never a question in our minds that the book would ever be anything but one based primarily on the ANES data. Those data were and are today the best data for teaching about American elections, as it is the best data for learning about and researching about elections. It is the “gold standard” in survey data. The ANES was already a body of 30 years of electoral and attitudinal data when we started. It has been our good fortune to be writing Change and Continuity for over 30 years. The standards of quality are the continuity, even though there have been a variety of changes in the questionnaire, sampling methods, and survey mode, reflecting scientific advances in surveying the public. The main advantage of the additional 30 years’ perspective, however, has been enriching the historical perspective on elections. Scholars and pundits have long drawn on previous elections in making their assessments of parties, candidates, and electoral outcomes. Now, however, we can add a serious understanding and 65 year perspective on the public as the foundation of elections. What has changed and what is continuous in the public can tell us much about how democracy works. The ANES completes what is most everywhere else an otherwise incomplete picture of democracy. This entry was posted in ANES 65th Anniversary on October 10, 2014 by David Howell. Post developed by Katie Brown and Deborah Schildkraut. This post is part of a series celebrating the 65th anniversary of the American National Election Studies (ANES). The posts will seek to highlight some of the many ways in which the ANES has benefited scholarship, the public, and the advancement of science. Do you have ideas for additional posts? Please contact us by email (cps-center@umich.edu) or Twitter (@umisrcps). In this post, we consider the impact of ANES on teaching. All take advantage of the time series to help demonstrate both the importance of fundamentals and the role of particular events in shaping attitudes, behaviors, and election outcomes. And all are written at a level that combines sophisticated methods but approachability such that undergrads can engage with them. The election data are even more widely used in activities related to teaching. Reports from the same roster of political scientists who were questioned about research use of the data indicate that the data were being used for teaching purposes in some 480 courses taken by more than 18,000 students… Given the reasonably short history of the systematic use of quantitative data by political science students in meeting course requirements, we were surprised to discover that three-quarters of the students using the data were actually undergraduates. 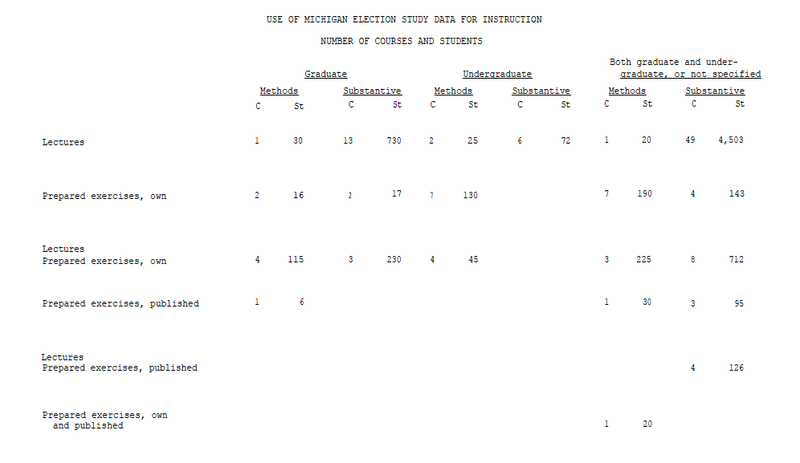 The hand typed table below from the 1977 proposal details the use of ANES (then called the Michigan Election Study) in the university classroom. Miller then concluded, “The election studies promise to play an increasingly significant role in undergraduate teaching.” Professor Deborah Schildkraut’s use of ANES nearly forty years after the 1977 proposal demonstrates the continued reach of ANES in the classroom. This entry was posted in ANES, ANES 65th Anniversary, National on June 9, 2014 by David Howell. Post Developed by Lynn Vavreck and Katie Brown. In this post, we consider the impact of ANES on a seminal work in the field, Lynn Vavreck’s The Message Matters. Lynn Vavreck is a Professor of Political Science and Communication Studies at the University of California, Los Angeles (UCLA). Her book, The Message Matters: The Economy and Presidential Campaigns, considers the role of the economy and candidate’s reactions to the economy in determining election outcomes. Without the ANES, I never could have written The Message Matters, which essentially treated each presidential candidate over the last 17 elections as an observation. With only 34 cases to work with, I leveraged the power of the tens of thousands of cases the ANES offered over that same time period to test implications of my work among voters. Because of these data, I was able to show that the things presidential candidates talk about in their campaigns affect voters in predictable and important ways. Quite apart from being irrelevant, presidential campaigns play an important role in election outcomes. Using ANES data, Vavreck concludes that the economy is the single most important feature of elections since 1950, affirming prior research in the field. The Message Matters goes one step farther, demonstrating that it is against the economic backdrop that candidates must cast themselves. The messages they promote matter. In particular, how they speak about the economy matters. And how they speak about other issues matters, particularly as it affects room for discourse about the economy. The Message Matters garnered critical praise upon its release. Paul M. Sniderman, Professor of Public Policy and Political Science at Stanford University, writes, “I have not read a book of comparable elegance of argument and mastery of analysis in years. It is outstanding on three dimensions. In its combination of analytical depth and economy, it is a model for research on election campaigns. In its fusion of theory and empirics, it is a model for research in political science. In its principled, persistent, ingenious efforts to turn up evidence against its own hypotheses, it is a model for the social sciences.” Larry M. Bartels, Professor of Political Science at Vanderbilt, raves, “Vavreck’s creative theorizing and informative historical analysis will change the way political scientists think about presidential campaigns. While giving campaign strategists their overdue due, she also sheds invaluable light on how political contexts shape their strategies and their odds of success.” Campaign consultant and pollster Stanley Greenberg declared the book “a must read” for future presidential candidates. In sum, Vavreck’s important book was made possible in part by the time series data provided by ANES. This entry was posted in ANES, ANES 65th Anniversary on April 29, 2014 by David Howell. Here we include comments from four prominent political scientists on how ANES has impacted their careers. I used ANES data in several articles early in my career and relied on other findings based on ANES data for the book I wrote with Mike Traugott, Campaigning for Congress. I served on the Board for a while and enjoyed ANES founder Warren Miller’s retreats in Arizona during the cold Michigan winters. We always went out for authentic Mexican cuisine, which was terrific. I met a lot of colleagues through the ANES. Scarcely a day goes by in which something I’m reading, debating, or studying is not in some way connected to ANES research. My very first day in graduate school in 1983 featured a lecture by UC Berkeley Political Scientist Merrill Shanks on the insights gleaned from the four-wave 1980 ANES. Today, decades later, I am about to run off to teach a class on political psychology, and our readings for this week include Philip Converse’s “The Nature of Belief Systems in Mass Publics” and Ansolabehere, Rodden, and Snyder’s 2008 American Political Science Review (APSR) article that uses ANES data to show Converse would have come to different conclusions had he used multi-item scales. Working with the ANES and the ANES team has been both beneficial for my research and a real learning experience— particularly being part of the ANES advisory board. The intense discussion among the Primary Investigators (PIs) and board during our meetings had the best aspects of sitting in on a seminar on survey design and methods. The ANES itself has inspired me to be part of other survey data collection efforts– notably the Latino National Survey (LNS, 2006), with co-PIs Luis Fraga, John Garcia, Rodney Hero, Val Martinez, and Gary Segura, and the Latino Immigration National Election Survey (LINES 2012-2013), with James McCann. Both of these drew on, learned from, and expanded the scope of the ANES. I’ve utilized the ANES in almost all of my publications. The most significant point in ANES history for me was when Daron Shaw and I were able to secure National Science Foundation (NSF) funding for the African-American oversample in 2008, a historic election. Using the African-American oversample, we were able to explore the determinants of black turnout in the 2008 election. This entry was posted in ANES, ANES 65th Anniversary on April 1, 2014 by David Howell. This is a guest post written by W. Phillips Shively, Professor of Political Science at the University of Minnesota. First and foremost, I can’t really separate ANES, especially in its earliest and most exciting time, from Philip Converse, Donald Stokes, and Warren Miller. Though the large, ongoing dataset is seen as their legacy, it was actually a byproduct of their greatest contribution (after all, there were other large surveys being done at the time, but only theirs became institutionalized like ANES). Their real contribution was research that was breathtakingly creative and rigorous for its time. In the 1960s, when I was in graduate school, they were my gods; if he had ever had a poster, Phil Converse would have been on my dormitory room wall. They pioneered considering the interaction of data from different levels of social organization, analyzing the interplay of historical change and individual behaviors, and applying data analysis to democratic theory. The ANES data set came to be of such importance in the field because they demonstrated the beautiful things that could be done with it. The high point of my graduate studies was a secondary analysis of the 1956 and 1960 national election studies, to test for various processes by which individuals were influenced in their voting by their community (i.e., an early and very primitive study of contextual effects.) This was pre-computer, so I did it all with IBM cards and a card sorter. It was the most exciting thing I did in graduate school, yet all I was doing was imitating Miller, Converse, and Stokes. In more recent years, ANES made a huge contribution when Steven Rosenstone took the lead in setting up the ambitious Comparative Study of Electoral Systems (CSES), a cooperative study involving roughly fifty national election studies. He was able to build on years of cooperation between the ANES and international scholars, started especially by Stokes and Converse. While the Inter-University Consortium for Political and Social Research (ICPSR) now serves a broad inter-disciplinary audience, it was initially a spin-off of the ANES. I attended the summer program in its second year, 1965. It consisted of a single class, co-taught by Stokes and Converse. Each day they opened some exciting new window for us. One day, Stokes introduced us to the problem of cross-level inference, which he had just started work on; I had never heard of it before, and it would become an important part of my work over the next fifty years. Another day they invited a young sociology graduate student, Gudmund Iversen, to come in and talk to us about an interesting new kind of statistics he had just learned of – Bayesian statistics. This entry was posted in ANES, ANES 65th Anniversary, Elections, Innovative Methodology, National on March 24, 2014 by David Howell. This is a guest post written by David Redlawsk, Professor of Political Science at Rutgers University and Director of the Eagleton Center for Public Interest Polling. For me, the American National Election Studies (ANES) goes back to my undergraduate days at Duke in the late 1970’s. In my voting behavior class we read The American Voter and The Changing American Voter. I personally did NOT “like” the view of voters from the American Voter, the basic sense that voters were not really competent. So The Changing American Voter, which suggested that voters were more issue-oriented (and thus more competent to hold representatives accountable), appealed to me. Both books were based on ANES data, and I thought it was interesting that they came to different conclusions (of course the argument was that things had “changed” in the late 60’s leading to more issue-oriented voters). As it turns out, of course, there is a strong critique of The Changing American Voter that comes because the ANES made major question wording and response option changes in 1964 versus prior studies. Bishop, Oldendick, and Tuchfarber (1978a; 1978b), Brunk (1978), and Sullivan et al. (1978) all addressed this issue. For me it made it clear that question design was critical to understanding public opinion. While my own work has tended to be more experimental, my first journal publication after starting my Ph.D. and after trying other directions for a career, required the ANES in order for us to validate our experimental work. Had we not had the ANES data from which we could construct our Voting Correctly measure, our findings might have remained an interesting (maybe) lab result. Instead they became a core part of our research, both in our APSR paper Voting Correctly (Lau and Redlawsk, APSR 1997) and our book How Voters Decide (Lau and Redlawsk, 2006, Cambridge University Press), both of which have been received with some interest in the discipline. As I transitioned to doing more survey research and directing the survey center at the Eagleton Institute of Politics, the basic things I learned about question design from the ANES have been important to my work. Overall, ANES has benefited my research and teaching. This entry was posted in ANES, ANES 65th Anniversary on March 18, 2014 by David Howell. Post developed by Katie Brown and Morris P. Fiorina. This post is the first in a series celebrating the 65th anniversary of the American National Election Studies (ANES). The posts will seek to highlight some of the many ways in which the ANES has benefited scholarship, the public, and the advancement of science. Do you have ideas for additional posts? Please contact us by email (cps-center@umich.edu) or Twitter (@umisrcps). Ahead of the 2012 Presidential election, Morris P. Fiorina, who is the Wendt Family Professor of Political Science at Stanford University and Senior Fellow at the Hoover Institution, wrote an op-ed for the New York Times. In the article, Fiorina used American National Election Studies (ANES) data to consider the role of the personal qualities of candidates in election outcomes. Fiorina referenced a research report published in the British Journal of Political Science (with Samuel Abrams and Jeremy Pope) after the 2000 presidential election in the United States. The report sought to explain Al Gore’s defeat in the election during a time of peace and prosperity. The report utilized a battery of questions from the ANES that asks respondents to detail what would make them vote for or against each candidate. The authors coded the respondents’ responses to measure candidates’ personal qualities. What was the relationship between this rating of candidates’ personal qualities and election outcomes? Looking at thirteen elections from 1952 to 2000, Fiorina and his colleagues found that in four elections the electorate gave a noticeable edge to one of the candidates, but the outcomes were not what pundits would have expected. For example, the highest rated Democratic candidate was Jimmy Carter, who lost to the lowest rated Republican candidate, Ronald Reagan, in 1980. And the lowest rated Democratic candidate was Bill Clinton, who won a landslide re-election in 1996. This entry was posted in ANES, ANES 65th Anniversary, Elections on March 13, 2014 by David Howell.